Precision. 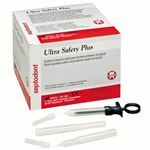 We stock Aesthesia needles, syringes, for obturation, prevention and prophylaxis and sutures for dental use. At Precision Dental we offer a wide variety of needles, syringes and sutures for dental use. We stock anesthesia needles , syringe , syringe needles, syringes for obturation, prevention and prophylaxis.